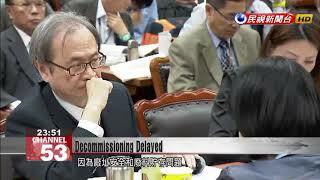 Today Taiwan permanently shut down the first of its six nuclear reactors. But although the reactor is no longer generating power for the grid, all of its spent fuel rods have been left inside. Officials said the fuel rods will stay in the power plant until a storage facility is approved by the local government. Until then, the formal process of decommissioning the reactor cannot begin. The permit for Reactor No. 1 in Nuclear Power Plant No. 1 has expired, but there’s nowhere for its fuel rods to go. A dry cask storage site built in 2013 has not been approved by the New Taipei Government, and so the rods cannot be removed from the plant. This isn’t a problem that just arose today. That dry cask storage site has been there a long time. The site has been sitting there for a long time. According to the Atomic Energy Council minister, the fuel rods are still in the reactor’s core, so its safety systems must be kept running. This means that technically, the reactor is running without a permit. The minister said this was a serious problem that New Taipei could solve simply by approving the dry cask storage site, which he said was safe. There are nearly 200 dry cask storage sites in the world. From what I understand, 170 of them are outdoors. It’s also that way in Japan. New Taipei has refused to authorize the storage site 13 times, citing safety concerns over slope stability, erosion risk, groundwater levels, and other issues.